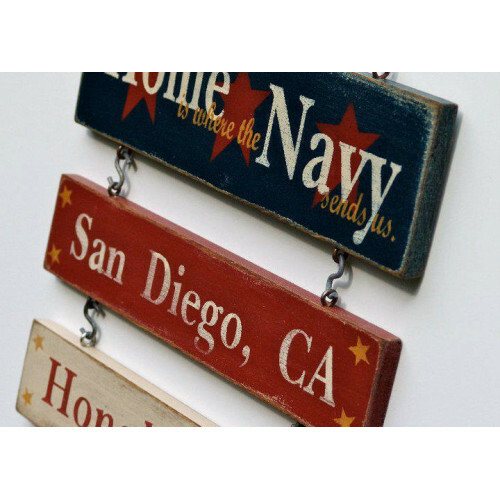 Perfectly Distressed, LLC Home is where the Military sends us. 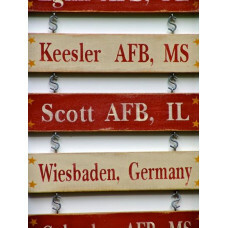 Looking for a great way to display your family's military journey, this is the place! You will find all of the options to customize your topper and FIRST duty station, just over there to your right. This listing comes with the topper and first duty station. The topper measures 12"x3.5"x.5" and includes mounting hardware. The duty station measures 12"x2.5"x.5" and includes 2 "S" hooks for hanging as well as the 4 eye hooks to mount to the bottom of the topper.